Mental stress, like the cumulative effect of having to make many decisions, causes glucose depletion in a specific area of the brain. 1 As a result, and in an attempt to conserve energy, the brain searches for shortcuts. One shortcut is impulsivity. For instance, a glucose-depleted brain overwhelmed by shopping choices wants the decision-making process to end. Hence, the impulse is to buy. Another shortcut is to err on the side of not making a mistake, as was found in a 2011 study where the glucose-depleted Israeli judges took a shortcut by not granting parole, knowing they could always grant parole the next time. In this study, researchers tracking an Israeli parole board found that parole granting fluctuated wildly depending on the time of day. For example, if a prisoner saw the board early in the morning, he had a 70 percent chance of getting parole, but if he was in front of the board late in the day, he had only a 10 percent chance. It was determined that this inequity in parole granting was connected with brain glucose depletion. 2 Clarity and Your Bodywork Session Pain-relief massage requires good communication between you and your massage therapist. If you're experiencing low brain glucose while on the massage table, your brain will look for shortcuts to conserve energy. A communication shortcut could result in inadequate feedback about the massage pressure, or you may not be inclined to express a concern (like mentioning that lying on your stomach for long periods of time hurts your back). Eating a small complex carbohydrate snack before the massage will help you avoid mental shortcuts without making you feel uncomfortable on the table. 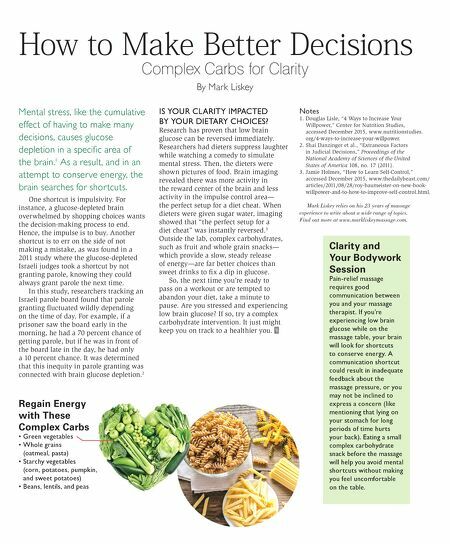 Regain Energy with These Complex Carbs • Green vegetables • Whole grains (oatmeal, pasta) • Starchy vegetables (corn, potatoes, pumpkin, and sweet potatoes) • Beans, lentils, and peas How to Make Better Decisions Complex Carbs for Clarity By Mark Liskey IS YOUR CLARITY IMPACTED BY YOUR DIETARY CHOICES? Research has proven that low brain glucose can be reversed immediately. Researchers had dieters suppress laughter while watching a comedy to simulate mental stress. Then, the dieters were shown pictures of food. Brain imaging revealed there was more activity in the reward center of the brain and less activity in the impulse control area— the perfect setup for a diet cheat. When dieters were given sugar water, imaging showed that "the perfect setup for a diet cheat" was instantly reversed. 3 Outside the lab, complex carbohydrates, such as fruit and whole grain snacks— which provide a slow, steady release of energy—are far better choices than sweet drinks to fix a dip in glucose. So, the next time you're ready to pass on a workout or are tempted to abandon your diet, take a minute to pause. Are you stressed and experiencing low brain glucose? If so, try a complex carbohydrate intervention. It just might keep you on track to a healthier you. B S Notes 1. Douglas Lisle, "4 Ways to Increase Your Willpower," Center for Nutrition Studies, accessed December 2015, www.nutritionstudies. org/4-ways-to-increase-your-willpower. 2. Shai Danzinger et al., "Extraneous Factors in Judicial Decisions," Proceedings of the National Academy of Sciences of the United States of America 108, no. 17 (2011). 3. Jamie Holmes, "How to Learn Self-Control," accessed December 2015, www.thedailybeast.com/ articles/2011/08/28/roy-baumeister-on-new-book- willpower-and-to-how-to-improve-self-control.html. Mark Liskey relies on his 23 years of massage experience to write about a wide range of topics. Find out more at www.markliskeymassage.com.